Wow, today might be colder, windier and rainier than yesterday! I think James and Tom thought I was a complete nutbar for standing up on the roof in this weather. It certainly was windy up there. Since the weather turned ugly, Hercules and Max have been far less active. This morning, they sat over on the nest ledge pretty much the whole time I was there. Since they were being nice and still, and since my digiscoping yesterday was such a rousing success, I decided to try digiscoping again. I count this as no harm, no foul, since I won’t have to waste money getting useless photographs developed. Digital cameras rawk! My results weren’t terrible, but not great either. You really need the stabilizing apparatus to digiscope at all. That’s the genius of me – it only took 40 mostly useless pictures to admit that thousands of professional wildlife photographers might be onto something. Max huddled near the west wall of the nest ledge. He looked twice his normal size with his feathers all puffed out for warmth. He sat down on his feet so that they tucked up into his cozy breast feathers. This is a typical roosting when it is cold out pose. Hercules stood in the same pose on the ledge of the niche directly to the west of Max. Both birds opened or closed their eyes about once every minute. How on earth do they sleep like that? They also shifted from foot to foot. I am glad that one of these “eyes half shut” pictures actually came out, because it shows Hercules’ neat eyelid. 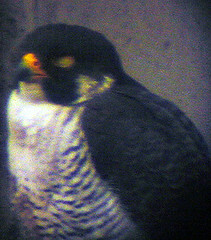 You will note that unlike human eyelids, a peregrine’s eyelid closes from the bottom. In fact, raptors have three eyelids in total – a bottom lid, a top lid and a nictating membrane. The nictating membrane is transparent and closes laterally across the eye. It protects the eye and keeps it moist. 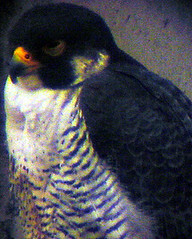 Since the peregrine’s survival literally depends on its vision, it’s no wonder there are so many protections built in. As far as why the outer eyelid closes from the bottom, Mary tells me that there are many theories regarding that. And where are our chick(s) in development by day 8? Their down continues to come in, so they are getting puffier by the moment. The sheathes of the primary flight feathers (remiges) are just beginning to break the skin on the wings. ~ by Steph on May 13, 2006.